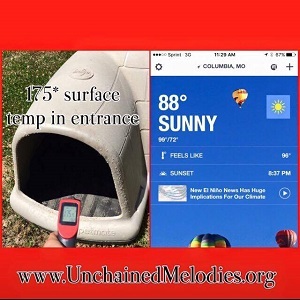 This week was the beginning of the scorching hot temperatures in mid-Missouri and even though we work tirelessly all year long for the chained/penned, abused and neglected dogs, our work is really just beginning. The calls, messages and emails are flooding us with dogs that are left outside all day, every day with nothing but a plastic box that is considered “shelter” by the officials. We did an experiment to show that this plastic box does NOT provide comfort for a dog that is outside in these extreme temperatures. There are ordinances that do not allow for dogs to be out in inclement weather which includes extreme heat and they need to be enforced. 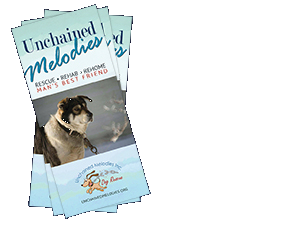 Ask owner if there is any way they can bring the dog into the home during the extreme heat. If all else fails, contact the authorities and insist they enforce the inclement weather ordinance/law.